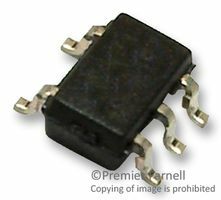 The LPV521MG/NOPB is a single nanopower Operational Amplifier with CMOS input, rail-to-rail input and output. It is designed for ultra long life battery applications. The operating voltage range of 1.6 to 5.5V coupled with typically 351nA of supply current make it well suited for RFID readers and remote sensor nanopower applications. The device has input common mode voltage 0.1V over the rails, guaranteed TCVOS and voltage swing to the rail output performance. The LPV521 has a carefully designed CMOS input stage that outperforms competitors with typically 40fA IBIAS current. This low input current significantly reduces IBIAS and IOS errors introduced in megaohm resistance, high impedance photodiode and charge sense situations. It is a member of the PowerWise family and has an exceptional power-to-performance ratio. The wide input common mode voltage range, guaranteed 1mV VOS and 3.5µV/°C TCVOS enables accurate and stable measurement for both high-side and low-side current sensing.